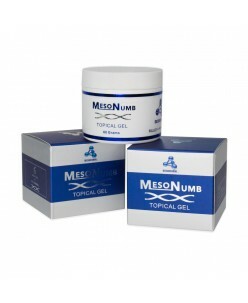 MESONUMB Topical Anesthetic Gel - 60 gr. A local anesthetic gel that is used for any cosmetic work such as LASER, PRAXEL, THERMAGE, FEATHER LIFT (pre-local anesthetic), DERMA ROLLER, FILLERS, MESOTHERAPY or DERMOPIGMENTATION and more other types of Cosmetic Lunch break procedures. Its benefit is that it is packaged in a unique liposome form which allo..